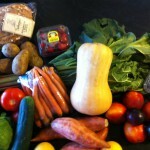 Bought this yummy bundle of local produce at Bacchus Marsh, on the way home from our Bellarine Rail Trail walk today. So the focus for this week is lots of fresh fruit & veg. I almost salivate looking at this photo.